Hold on to your cheesesteaks Philadelphians, I'm about to say something shocking.... I don't like Tastykake. Tastykake is a hugely popular snack company in the NJ-PA region. The company's offerings are pretty similar to Little Debbie and Hostess, so we're talking grocery-store-quality cookies, snack cakes, pies, and doughnuts, but they're more unique items are their baked pies, "Koffee Kakes" and "Kandy Kakes." If you haven't noticed by now, the Kompany really likes Kreative spelling. Back in 2013 I tried Tastykake's normal pumpkin baked pie and I was not impressed. It's a seasonal staple, and they re-release it every year, but this is the first time I've seen them do a cheesecake version of it. I opened up the box and got a better look at the pie inside. 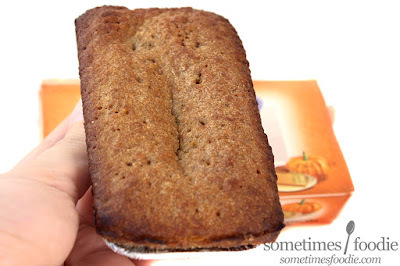 The crust looks darker than the one from the original pumpkin pie version. The box doesn't say anything specific about the crust, and I don't feel like filtering through the fine print ingredients to confirm this, but off the top of my head I'm thinking that they're going for a graham cracker-kind of crust, since this is a cheesecake pie and all that makes sense. The crust smells...like grocery store pie crust with a hint of cinnamon, but the spice aroma is likely coming from the filling and not the crust on it's own. Thankfully this pie stayed intact when I removed it from it's pie-pan-prison, and I took my first bite. So how does it taste? The crust has a deeper, more complex, flavor than the normal baked pie version, but that's not saying much. It's very dry, like Pop-Tart-crusts kind of dry, but after years of eating Tastykake pie's I knew what to expect. On the other hand, the filling is not at all what I expected, but oddly enough it's not that bad. It may not look like cheesecake, or feel like it, or taste like it, but it was certainly tastier than the normal pumpkin pie version. 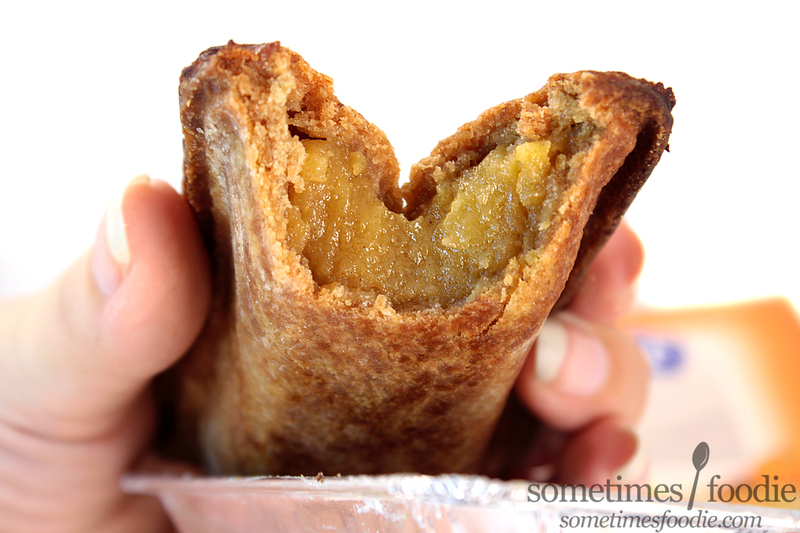 This filling is light, with a custard consistency, and a hint of cream-cheese-y tang. Now as far as pumpkin flavoring is concerned, this was more pecan-pie than pumpkin, which is really weird since this is supposed to be a cheesecake...but it works. This is a grocery store pecan pie mixed with pumpkin pie filling, and it really wasn't a bad combination! 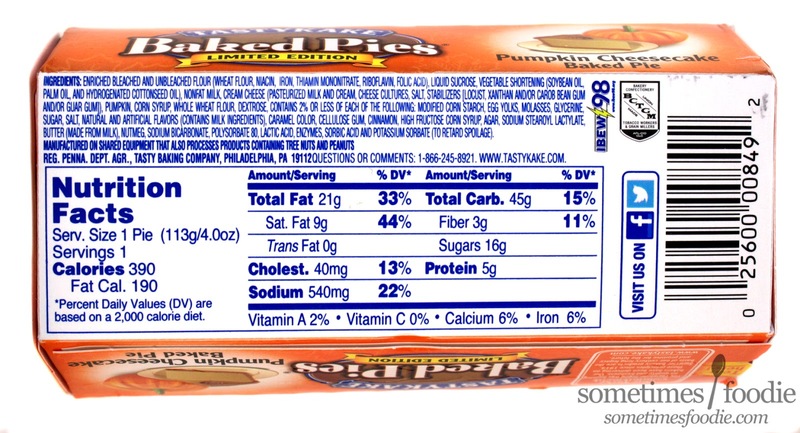 The real issue, other than the dry crust, is that this was poorly labeled and marketed. If they sold this as a mini pumpkin-pecan pie I think the flavor profile would match it's name a lot better, it'd be a more unique fall offering, and the masses might be more excited to try it. It's artificial as all get-out, but as long as you're not expecting a high-class dessert it really isn't all that bad and I actually enjoyed it quite a bit. On a Pumpkin Scale of 1-5 (5 being the most pumpkin-y) I’d give this a 3. 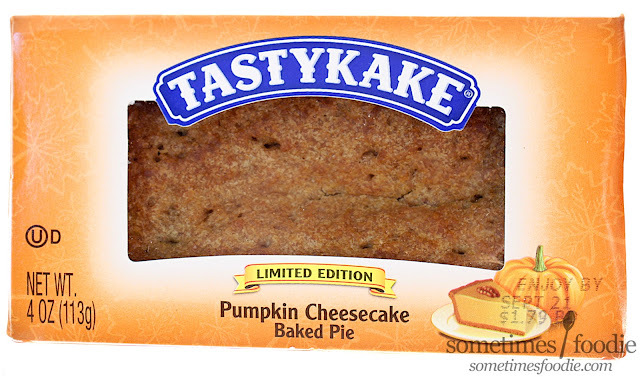 I enjoyed it more than normal Tastykake pumpkin pies, but it wasn't very cheesecake-y. It definitely needs a new name. 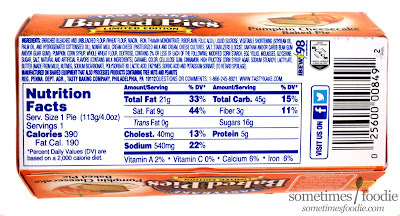 Wouldn't buy it again, but it's different enough from the normal pumpkin pie version to be worth trying and I feel like this is honestly better than it's original pie-form.